To Cite: Alavian S M, Haghbin H. Relative Importance of Hepatitis B and C Viruses in Hepatocellular Carcinoma in EMRO Countries and the Middle East: A Systematic Review, Hepat Mon. 2016 ; 16(3):e35106. doi: 10.5812/hepatmon.35106. Context: Hepatocellular carcinoma (HCC) is the second most common cancer-related death worldwide. Although many factors including dietary aflatoxin B1 (AFB1) and alcoholic and non-alcoholic fatty liver diseases can lead to HCC, globally most HCC cases are due to hepatitis B virus (HBV) and hepatitis C virus (HCV). Considering the importance of these viral factors in most HCC cases and relative lack of literature from eastern Mediterranean region office of world health organization (EMRO) countries and the Middle East, we decided to perform this systematic review to find distribution of viral etiology of HCC in these regions. Evidence Acquisition: In this systemic review, we included all studies from 1 January 1989 to 1 September 2015 with at least 20 samples that measured HBV surface antigen (HBsAg) and antibodies to HCV (anti-HCV). The authors searched MEDLINE, Embase, Popline, Web of Science and WHO indexed databases. We searched the following MeSH terms; hepatocellular carcinoma, hepatitis B virus and hepatitis C virus or hepacvirus. Only studies using second- and third-generation HCV assays were included. Only articles studying HCC patients from EMRO countries and the Middle East were analyzed. Duplicate results that reported the same cases more than once were found and omitted. Studies in English and Farsi were reviewed. If the study was eligible, we recorded the following data; the first author, publication year and journal, study population and number and percentage of patients with different serologic statuses. Results: We found 44 studies from 12 countries in EMRO and the Middle East. HCC cases from Iran, Lebanon, Turkey and Yemen were mainly due to HBV, while those of North African nations (Egypt, Tunisia, Morocco, Algeria and Somalia) in addition to Saudi Arabia and Pakistan were mostly HCV related. Sudan showed a high seronegativity and HBV infection in its HCC cases. Unfortunately, some countries from EMRO and the Middle East did not have eligible studies. Conclusions: HBV and HCV are important culprits of HCC in EMRO countries and the Middle East and different nations need different strategies to tackle them accordingly. Countries with high rates of HBV such as Turkey should continue their HBV vaccination and also increase sanitation. Nations with high HCV rates such as Egypt should maintain their blood product monitoring in addition to increased sanitation, especially regarding injection drug users (IDU). Worldwide, in adult male population, hepatocellular carcinoma (HCC) is the fifth leading diagnosed cancer and the second most common cancer-related death. In adult females, it ranks the ninth most common diagnosed cancer and sixth cause of cancer related deaths. The cancer is twice as high in men as women (1). Statistics showing identical HCC related death rates and incidence rates indicate its high case fatality. Although many culprits are found to cause this aggressive cancer, most cases result from chronic hepatitis B (HBV) and hepatitis C virus (HCV) infection; of these two viruses, HBV accounts for 80% of causes of viral hepatitis (2). The wide geographical, regional and even racial disparities in prevalence of HCC is mostly due to differences in viral hepatitis prevalence (3). The little remaining cases of HCC can be attributed to a cornucopia of other reasons such as aflatoxin B1 (AFB1) in diet, alcoholic and non-alcoholic fatty liver diseases and some metabolic diseases such as hemochromatosis (4). AFB1 acts synergistically with HBV in hepatocellular carcinogenicity (5); however, improvements in grain storage have reduced AFB1 in many countries (6). Globally speaking, the lion share of HCC is seen in Asian and African countries where HBV and HCV are most prevalent (1). Some countries in Eastern Mediterranean region office of the world health organization (EMRO) and the Middle East have high incidence rates, whereas some have low rates. For example, HCC incidence rate in Western Asian countries such as Iran to Lebanon and Turkey to Yemen are amongst the lowest in the world. While, North African countries rank the third highest in the world; ranking immediately after Eastern and South-Eastern Asian countries (1). Due to these vast varieties, we selected this region as an ideal place to study the reasons of international discrepancies of HCC incidence rates by finding the etiology and viral factors in the countries of this region. Changes in HBV and HCV prevalence stem from their characteristics. HBV, if transmitted vertically from mother to neonate mainly leads to chronic hepatitis, while most infected adults do not become chronic. It leads to longer duration of infection and integration of HBV inside the hepatocytes and a higher risk of HCC (7). Since it takes years for HCC to develop in chronic hepatitis cases, vertical transmission is an important contributor to high rate of HBV carcinogenesis in endemic areas. On the other hand, HCV, which is mainly transmitted via blood products and contaminated needles in case of IDU, usually leads to a chronic hepatitis in adults (8). Due to its mode of transmission, public health programs to promote needle exchange for harm reduction in IDUs as well as improving safety in hospitals and blood product screening for HCV are important factors determining the prevalence of HCV in a country. Hence, neighboring countries can sometimes have significant HCV prevalence rate differences due to variable health policies (9). The study was performed according to the PRISMA guidelines criteria (10). After consulting an expert generalist librarian, we chose the following MeSH terms; hepatocellular carcinoma, hepatitis B virus and hepatitis C virus or hepacvirus. All articles published from 1 January 1989 up to 1 September 2015 in MEDLINE, Embase, Popline, Web of Science, and WHO indexed databases were searched. Moreover, references of the aforementioned articles were searched not to skip any relevant articles (ancestor search strategy). Only EMRO and Middle Eastern countries were included. Endnote X6 was used to catalogue the articles. Before initiation of literature search, we established the following inclusion and exclusion criteria. Inclusion criteria were studies with a minimum of 20 samples pathologically proven HCC and a report of prevalence of HBV surface antigen (HBsAg), anti-HCV antibodies, co-infection and seronegative. Other liver neoplasms were excluded. Furthermore, studies reporting first-generation enzyme linked immunosorbent assay (ELISA) for HCV were excluded due to low sensitivity and specificity compared to newer second- and third-generation tests (11). Studies on recently immigrated populations were grouped as their country of origin. For instance, one study from the US recruited Somali immigrants; therefore, we grouped them in Somalia (12). Articles in English and Farsi were searched. The flowchart in Figure 1 shows the process of review of publications. Pertinent data included country, the first author, publication year and journal, study population and number and percentage of all serology test results, namely HBsAg+, anti-HCV+, HBsAg/anti-HCV co-infection and seronegative cases for both markers. Data abstraction was performed systematically by two authors independently. The quality of methodology of the studies was assessed using the standardized data collection forms derived from the Newcastle-Ottawa scale (NOS) (13). All data were systematically double checked to avoid any errors. To avoid covering the same HCC patients more than once, time, and location of the studies were crosschecked and only the most recent studies were used. In case of unclear study methods, authors were contacted for any additional information and details, which are added to Tables 1 and 2. We studied 44 studies, 8267 cases, from 12 countries (Tables 1 - 3, Figure 2). Egypt had the highest number of cases, followed by Pakistan, Turkey and Yemen. Significant differences in HBV and HCV etiology were observed inter- and sometimes even intra-countries in the region. aData is derived From GLOBOCAN 2012, IARC-14.11.2015. Abbreviations: HBV, hepatitis B virus; HCV, hepatitis C virus. North African EMRO nations are Egypt, Somalia, Djibouti, Tunisia, Morocco, Sudan and Libyan Arab Jumahiriya. Egypt with 4215 cases single-handedly provided more than a half of all HCC cases for this systematic review. After pooling data from nine Egyptian studies, we concluded that 79.8% of HCC patients in Egypt are infected with HCV. This high rate ranks the first in the world. In total, 6.9% are HBV positive and 8.2% are co-infected with both viruses. Moreover, the largest sample sizes in this systematic review belonged to Egyptian studies. El-Zayadi et al. studied on 1328 HCC patients and showed that 69% of them were HCV positive (19). Another large and more recently published study by Shaker et al. on 1313 HCC patients found a higher rate of HCV infection in aforementioned patients (91.3%) (15). HCV is the main culprit for HCC patients from most other North African nations. Bahri et al. conducted an international study on 164 HCC patients from Algeria, Tunisia and Morocco and found that slightly more than a half of them were HCV related (14). Said et al. study on 74 Tunisian cases yielded 63.5% seropositivity for HCV. HCV is also the main cause of HCC in Somalia (48). From the two studies performed on Somali HCC patients, the older one from 1993 by Bile et al. on 62 cases demonstrated that HBV and HCV infections were present in 37% and 35% of cases, respectively. The more recent study on 28 Somali migrants to Minnesota, USA found a high rate of 71% of HCV infection in HCC patients (46). After studying North African countries, we found that Sudan was the exception regarding etiology of HCC. Omer et al. studied 115 Sudanese HCC patients in 2001 and found that they were mostly seronegative (47%) or HBV infected (41.7%), whereas only 10% were due to HCV. Unfortunately, we were not able to find any study fulfilling our inclusion criteria, from Djibouti or Libyan Arab Jumahiriya. Arab countries of the Middle East are Bahrain, Iraq, Jordan, Kuwait, Lebanon, Oman, Palestine (West Bank), Qatar, Saudi Arabia, Syrian Arab Republic, United Arab Emirates and Yemen. Regrettably, only Lebanon, Saudi Arabia and Yemen had qualified studies for our systematic review. Saudi Arabia with 4 studies and 474 cases was the main contributor to our data. Overall, 40% of Saudi HCC patients were the result of HCV, while 35% were HBV related. The largest Saudi study by Sanai et al. conducted on 206 HCC patients in 2010 showed HCV preponderance in Saudi HCC patients (44). While, two other researches by Alsohaibani et al. reaffirmed HCV predominance (43), the oldest study by Ayoola et al. on 108 cases in 2004 ended up with a much higher rate of HBV infection (63.6%), compared to a tiny 8.5% of HCV. This showed a chronological disparity in the etiology of HCC in Saudi Arabia (45). Unlike Saudi Arabia, HBV was the main reason for HCC in Yemen and Lebanon. Grouped data from two distinct studies on 339 Yemeni patients considered HBV as the major cause of HCC (42.5%). Nevertheless, dissimilarity was observed concerning Saeed et al.’s research on 88 Yemeni patients, which illustrated that more than half of their cases were seronegative (57). We only found one study from Lebanon where Yaghi et al., reported a 61% HBV positive rate in 92 HCC patients (25). This category consists of Afghanistan, Cyprus, IR Iran, Turkey and Pakistan. Pakistan with 15 studies and 1783 cases provided most studies and cases among the Middle Eastern nations. HCV ranked the first cause of HCC in Pakistani patients (53.7%). All studies confirmed the important role of HCV as the main cause of HCC, except two studies published before 1998 by Abdul Mujeeb et al in which 43% and 78% of HCC patients were attributed to HBV, respectively (40). Furthermore, Turkey with seven studies on 850 HCC patients provided a reliable amount of data for this systematic review. Analysis of data proved that more than half of Turkish HCC cases were HBV related (55%), whilst the remaining were equally likely to be either HCV positive or seronegative (20%, each). Results of all the studies from Turkey were roughly the same and no inconsistency was detected. Our team detected only one eligible study from IR Iran which provided information of 71 HCC positive patients. In total, 52% of Iranian patients were HBV positive, when only a small percentage of them were due to HCV (8.5%). A high percentage of cases from Iran were seronegative (39.4%), which is the highest in the Middle East and the second highest in our study after Sudan. Afghanistan and Cyprus had no appropriate studies for this systematic review. This systematic review, on HCC cases in 12 countries, underlines the variation of etiology of HCC in different locations. The most important contributor to this vast variety is the difference in viral etiologies. Almost 3 of 5 HCC cases are associated with HBV or HCV. These numbers could be very different in various countries. Asian and African countries are the major contributors to global share of the virus. Since HBV is the main etiologic factor of HCC in those countries, HBV is the main cause of HCC in the world (3). However, In Pakistan and North Africa, HCV played a more important role than HBV in causing HCC. High prevalence of seropositive HCC cases in African and Asian countries does not mean that seronegative cases are unimportant. We are observing an increase in obesity and metabolic syndrome prevalence all around the world, in both developed and developing nations (7). Consequently, authorities in hyper-endemic areas of Asia and Africa should never ignore these new trends. This study, although inclusive and comprehensive, had some limitations. One of the shortcomings of our study was lack of high quality data from many Middle Eastern and African countries. Developed nations with the lowest prevalence of HCC have inclusive and reliable data registry systems, something that is lacking in developing nations struggling with the highest burden of HCC. Although the study portrayed percentages of hepatitis in the countries, it failed to demonstrate subtle temporal changes in etiologies. For example, HBV vaccine has proven quite effective in Africa, and Saudi Arabia where its effects on HCC would be seen in decades (58, 59). Taiwan is also seeing a decrease in HBV and a surge in HCV associated HCC (60). Like Taiwan, Saudi HCC patients used to be HBV related but nowadays most are HCV related. Alkhayat et al. contributed this change to the 25-year-old HBV vaccination program in Saudi Arabia (42). Nonetheless, this trend is mainly due to better sanitation practices, not HBV vaccines (1, 61). Although vaccines have been proven very effective in HBV prevention in adolescents, it takes decades to observe their effect in HCC reduction in adults. It is predicted that with the current treatment method, number of HCV infected cases would remain stable through 2030 in Saudi Arabia. However, it has been speculated that in case of performing an aggressive screening and a strict treatment program, there would be more than 95% reduction in advanced stages of HCV (62). Another shortcoming of this systematic review was the fact that samples from some studies were small and not well representative of their population. What is more, some researches were conducted approximately 2 decades ago and the circumstances in the populations might have changed since then, not mentioning advancement of laboratory techniques with different sensitivities and specificities. Furthermore, many factors such as important contributors to HCC like AFB1, alcohol and metabolic syndrome were not studied since they were not simultaneously covered in many studies. Additionally, since occult HBV is associated with HCC, it is not detectable easily by the aforementioned methods and it is probably underestimated in hyper endemic areas; hence, a good proportion of HBV negative cases in HBV hyper-endemic areas could have occult HBV infection. For example, Honarkar et al. found a 22% prevalence of positive HBV DNA in seronegative chronic liver patients in IR Iran (63). Another study from Sudan on 91 HBsAg negative patients revealed that 51.6% of them had positive HBc antibodies and 3.3% had HBV DNA using PCR (64). Carcinogenicity is not limited only to occult HBV patients. Occult HCV cases are also proven to be prone to HCC (65). Another limitation of this study was the fact that we did not segregate etiologies based on gender due to lack of data. Lastly, presence or lack of viral markers at the time of HCC diagnosis does not necessarily show causality because there are a few decades of lag between contracting hepatitis viruses, developing chronic hepatitis and subsequent transformation to HCC. For example, some developed countries that are observing a reduction in their HCV prevalence in the general population have not yet seen its long-term effects in decreasing HCC (66). The opposite also holds true; in Nigeria where there has been a recent surge in HCV in the general population, HCV related HCCs are still at low rates, relatively (9). Similarly, in IR Iran, most HCV infected patients are IDUs and very young; therefore, HCV related morbidity and mortality would show a 200% increase by 2030 (67, 68). IR Iran has one of the lowest rates of HCV prevalence in the Middle East, but under the current treatment paradigm, HCV prevalence rate will increase. More importantly, HCV disease burden will show a larger boost, due to aging of the current young HCV infected Iranian cohort and appearance of sequelae such as HCC (62). Consequently, IR Iran must seize the opportunity to treat those patients before becoming too late when their conditions turn overwhelming (62). To name other studies on viral factors of HCC in EMRO countries, one must mention the systematic review by Alavian et al. on epidemiology of HCV infection among thalassemia patients in the region (69). 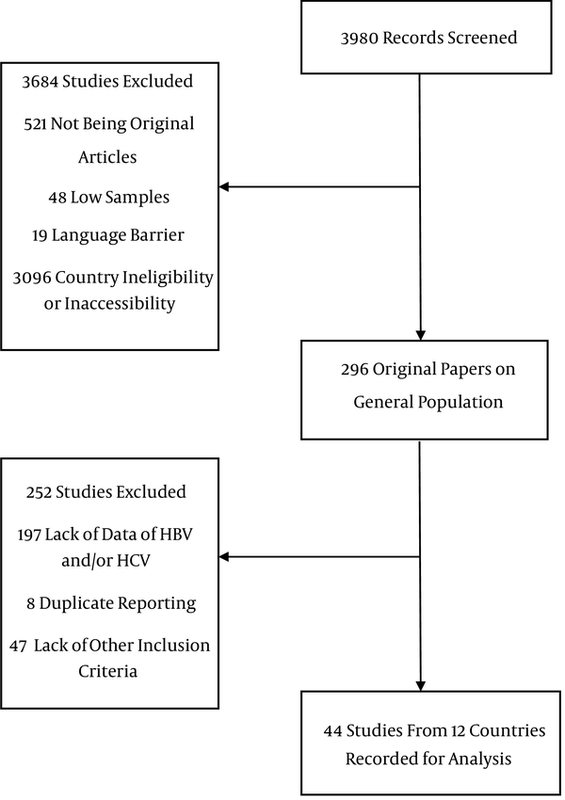 However, unlike this systematic review, that study did not measure HBV prevalence amongst HCC patients. Other studies investigating viral and non-viral etiologies of cirrhosis mortality are published. As part of global burden of disease project, viral and non-viral risk factors are measured in patients with liver cirrhosis (70). Considering viral etiologies, their findings match those of ours in this study. Nevertheless, share of non-viral etiologies contributing to cirrhosis is significantly larger than our results regarding non-viral factor roles in developing HCCs. This finding is due to the fact that alcohol abuse can lead to cirrhosis, but has a lower risk of developing HCCs compared to viral etiologies (71). To conclude, we reaffirmed the importance of HBV and HCV in developing HCC all around the world. We also encourage primary preventive measures since treatment is costly and cumbersome. Vaccination is the mainstay for HBV prevention, which has proven its effectiveness time and again. Since vaccination programs are causing a reduction in HBV cases, HCV is catching up fast as the leading cause of HCC. As there is no vaccine for HCV, integrated preventive measures such as better blood screening techniques, promoting safe injection practices among IV drug abusers and other harm reduction programs must be the main strategy to reduce HCV related HCC risk in the future in most of the world, including EMRO countries and the Middle East. Financial Disclosure: Authors declared no financial interests related to the material in this study. 34. Hamza H, Akhtar S, Hamid S, Niaz S, Janjua N, Khan M. Role of hepatitis B and C virus infections in hepatocellular carcinoma: A case-control study in Karachi, Pakistan . XVIIth IEA World Congress of Epidemiology.